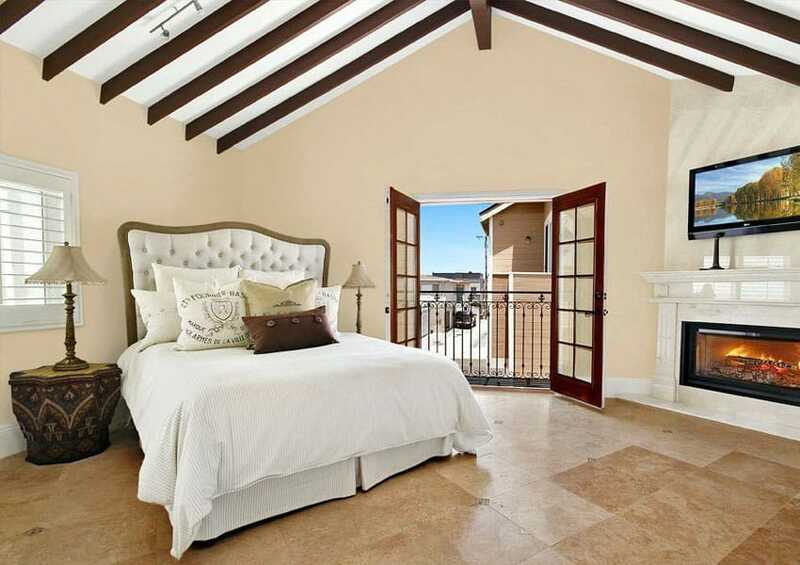 Luxury master bedrooms with fireplaces are inviting and romantic. 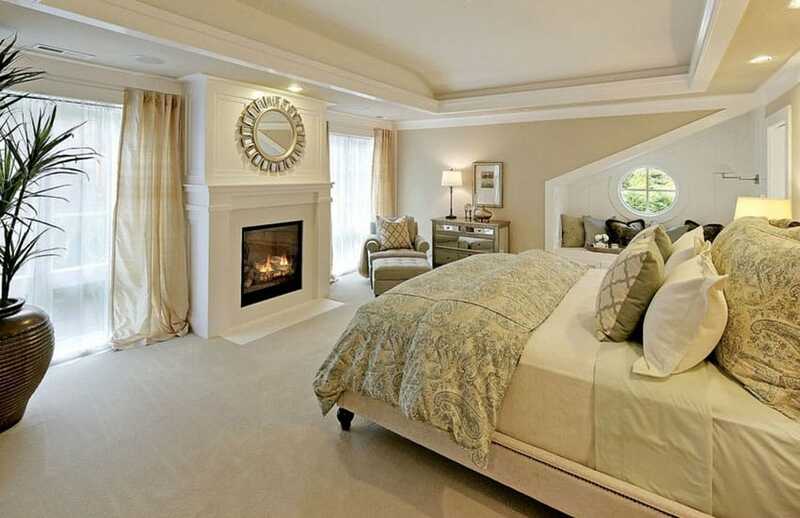 A fireplace allows you to create the perfect ambiance in your bedroom to cozy up and enjoy the space. They look attractive, can help keep things warm during colder months and increase a home’s resale value. 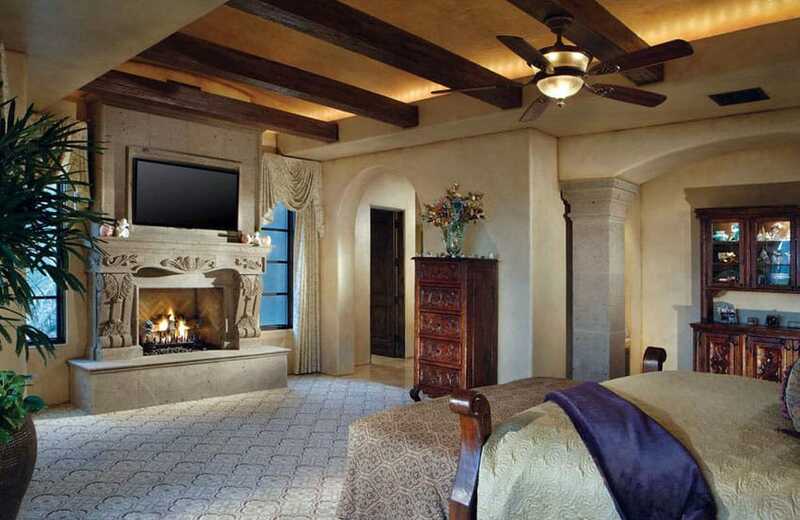 Below you’ll find bedroom fireplace designs to give you ideas for creating your own relaxing master suite retreat. 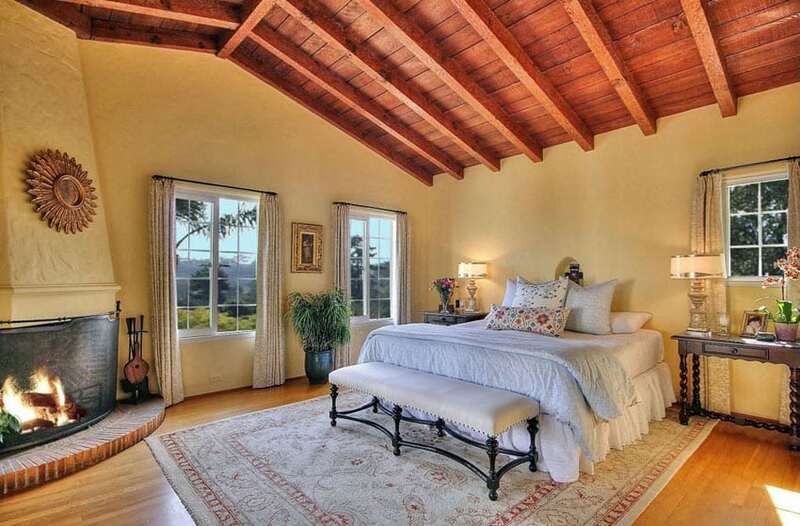 The traditional style bedroom in the picture above has a nice neutral color palette to accentuate its elegant design. Further enhancing the cozy atmosphere of the space is the built-in electric fireplace with a mantel framing, making it look like a traditional wood fireplace to match with the interior style, but without consuming as much space. Fireplaces have always been an integral part of homes, especially in countries with four seasons, as it is integral in keeping the interiors warm and livable. With the advent of modern technology, and with the rising cost of land and floor space, the fireplace has taken a backseat and was replaced with the more fancy and efficient centralized heating systems. Wood-burning fireplaces – this is the traditional fireplace we see in older homes and buildings. It’s the classic & romantic smell and sound of the wood that attracts people to use the traditional style. It needs to be integrated into the architectural design of the house/building for it to be efficient. 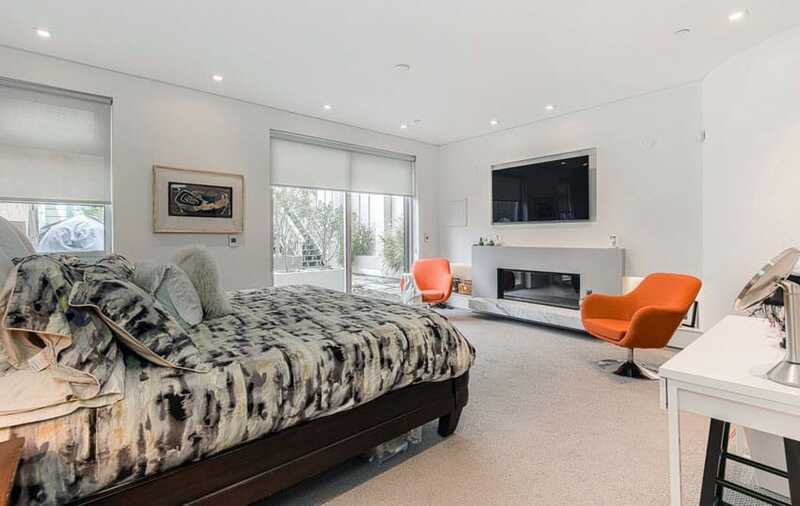 A gorgeous contemporary style bedroom with a very clean and sleek look. It has plain, cream-colored walls and ceiling, and dark wengue wood frames for the furniture pieces and window frames. To match the interior style, they used a gas-burning fireplace installed on a wall niche with a wall-mounted TV right above it. This simple modern bedroom integrates its minimalist electric fireplace into its entertainment center design, seamlessly blending it into the wall to make it look like it’s part of the wall. When turned off, it simply looks like a wall-mounted TV, so it can perfectly change the ambiance of the place as needed. Light yellow accents combines with creamy beige wall paint adds a warm feel to this cozy Mediterranean style bedroom, but the built-in electric fireplace completes the cozy ambiance and increase the warm feel of the space. The black electric fireplace was framed with a stone mantel to match the style of the bedroom and accentuate the area. This gorgeous bedroom is a more casual feel then the previous examples, but it still has the warm, cozy feel despite its all-white color scheme. A few pieces of beige pillows, golden walnut wood flooring and jute rug adds enough warm tones and texture to the space to make it feel less “cold”. Of course, the low-profile electric fireplace built into the wall completes the ambiance to create a more romantic atmosphere to the space. Due to the very limited space of the bedroom, the built-in gas-burning fireplace is the perfect choice for this space as it doesn’t consume too much space. It was installed on a wall in front of the bed and was framed with slate tiles and wooden mantel to accentuate the area. There are also some scented candles and other decorative pieces placed on the mantel. This bedroom is a gorgeous mix of contemporary interior architecture and classic furniture pieces. The plain surfaces of the walls, floor and ceiling helps balance the over-all look, as classic furniture pieces have more intricate forms and details. In front of the bed, there is a built-in fireplace placed on a niche made for the purpose, making it integrated into the interior architectural structure. The taupe palette used in this bedroom design gives it a very universally-pleasing aesthetic which will definitely last through various shift in trends. The high ceiling makes the room feel more spacious, despite its actual floor area. 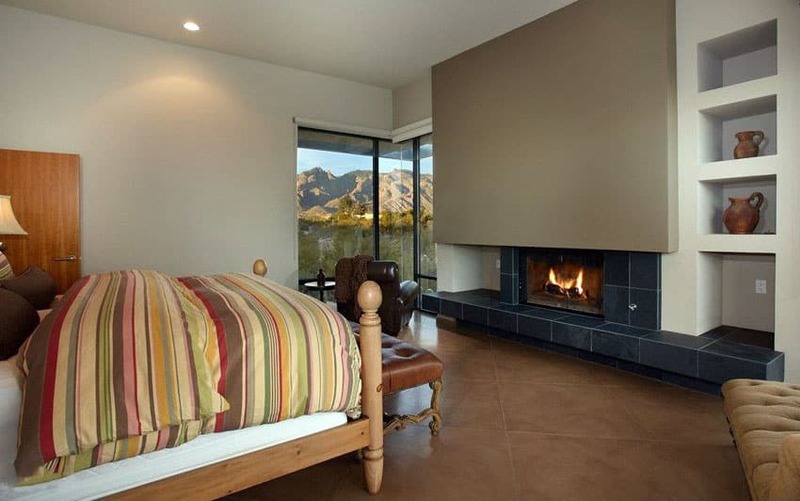 To enhance the ambiance of the bedroom, a gas-burning fireplace was installed on a veneer-clad wall. The modern matte black frame of the fireplace creates a matching look with the TV placed right above it, making them look like a set piece. The larger floor area of this bedroom allows the use of bigger furniture pieces, and also makes it feel a little more grand. It has a neutral cream color scheme with pops of purple and blue for accent. The floors uses gorgeous polished beige limestone, which extends up to the protruding wall made for the fireplace. The gas-burning fireplace used in the space is built onto a niche on the limestone wall, creating a seamless frame so that it looks like the fireplace was carved out of the wall. Large wood planks on the floor and classic French furniture pieces create a lovely French provincial vibe to this bedroom space. 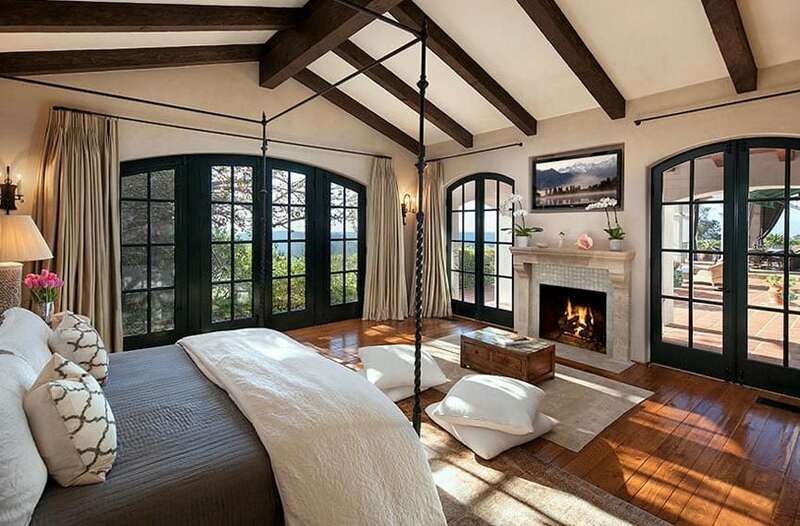 Because this bedroom is on an old structure, it has a real wood-burning fireplace which is made from fire bricks and framed with white paneled wood boards. The wood-burning fireplace in this bedroom is definitely the focal point of the space as it is smacked right in the middle of the room to separate the sleeping area from the sitting area of the room. This also allows the fireplace to be used for both the sitting area & the sleeping area simultaneously, or separately, as needed. The fireplace is clad with stone masonry, and the covered with wood paneling and brick accents to further enhance its look. This simple bedroom uses solid wood rococo furniture creating curvy silhouettes and elegant curved lines. The bedroom is divided into a sitting area and a sleeping area via a diagonal wall partition in which a gas-burning fireplace was installed on. The small fireplace definitely blends into the design, looking like a small cabinet when not turned on, but providing the room with warmth when used. A Mediterranean-inspired bedroom with a lovely neutral color palette, this bedroom is a looks elegant and classy wit its combination of textures, colors and finishes. 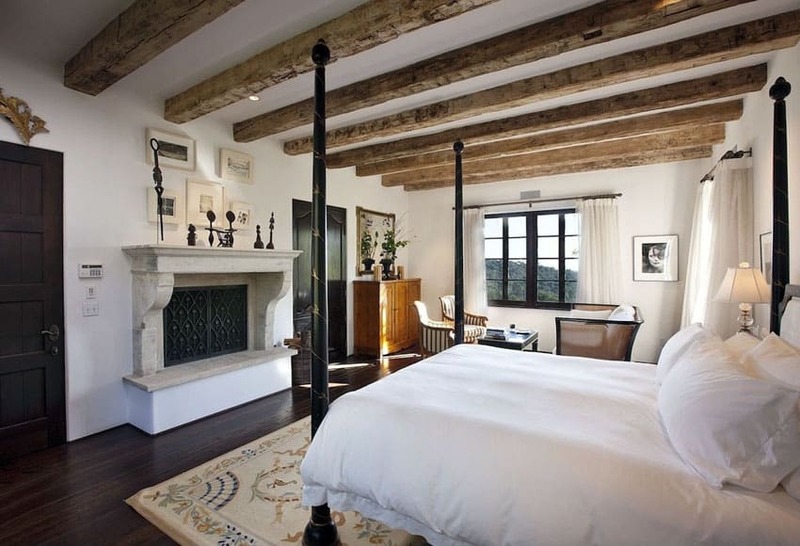 On one wall of the bedroom is a classic wood-burning fireplace which was installed on a slightly raised platform so that it can efficiently provide warmth for the high bed. The fireplace has firebricks inside, but the mantel used is made from white marble to match with the elegant look of the bedroom. This contemporary bedroom goes for a very subtle nautical-inspired theme. The colors are mostly composed of white and grays, with navy blue accents. Because of the modern styling od the space, it also goes for a modern-style gas-burning fireplace which is built onto a partition wall in the room. It has a dark gray metal framing to match with the modern theme of the space. 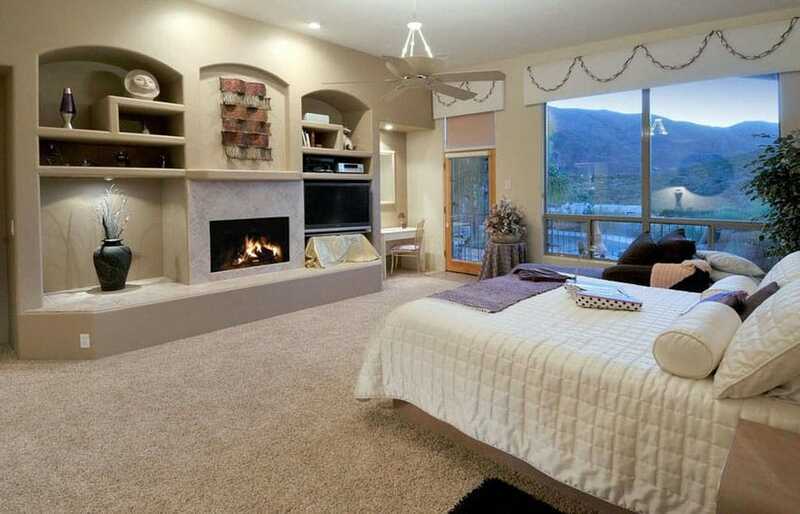 This Luxurious bedroom places its modern style gas-burning fireplace in a very unique location. 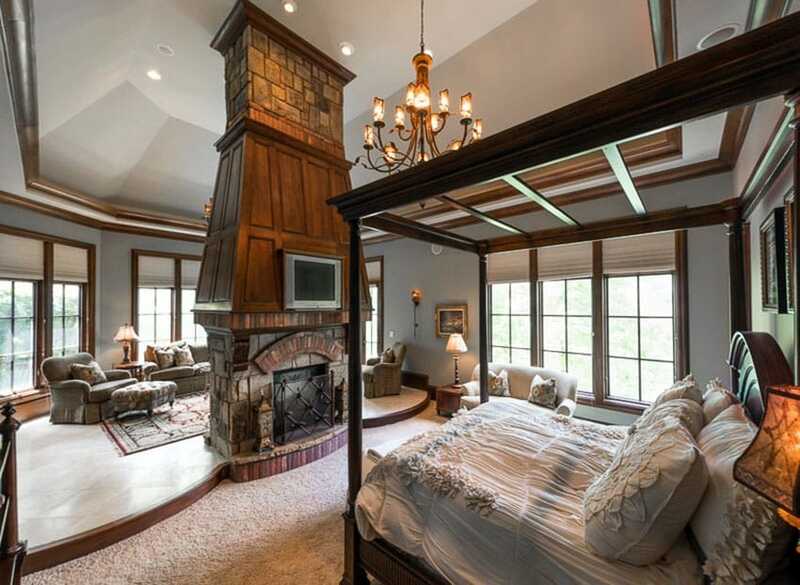 While fireplaces are usually built onto walls or partitions, this bedroom intergrated it into a column-like structure, and has glass on its 3 exposed sides, instead of the usual front side. 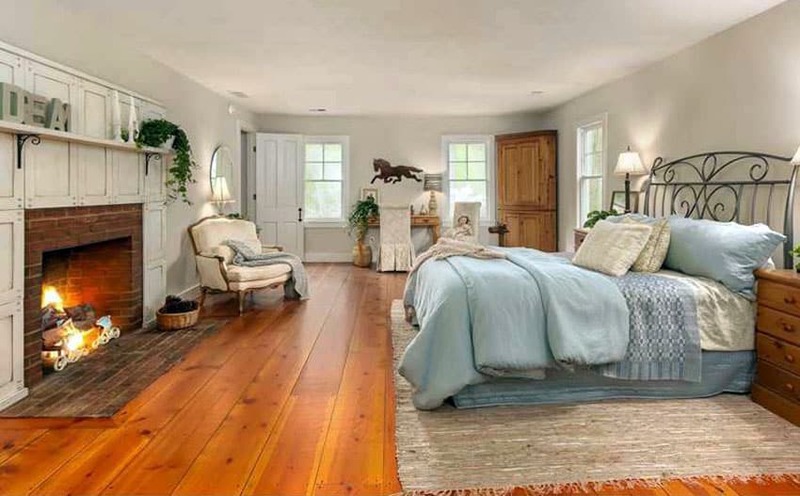 What better way to complete the look of this classic style bedroom than with a romantic wood-burning fireplace? It definitely completes the cozy ambiance of the bedroom and gives it a more relaxing atmosphere. While lots of glass doors makes this room look very pleasant and airy, it can be little too cold during winter therefore making the electric fireplace installed on the wall very integral in the design. Heavy wood furniture pieces with elegant curvy forms in combination with solid wood floors & exposed wood ceiling gives this bedroom a rest-house like feel. To match with the classic feel of the interiors, an equally classic wood-burning fireplace with solid stone mantel was used. 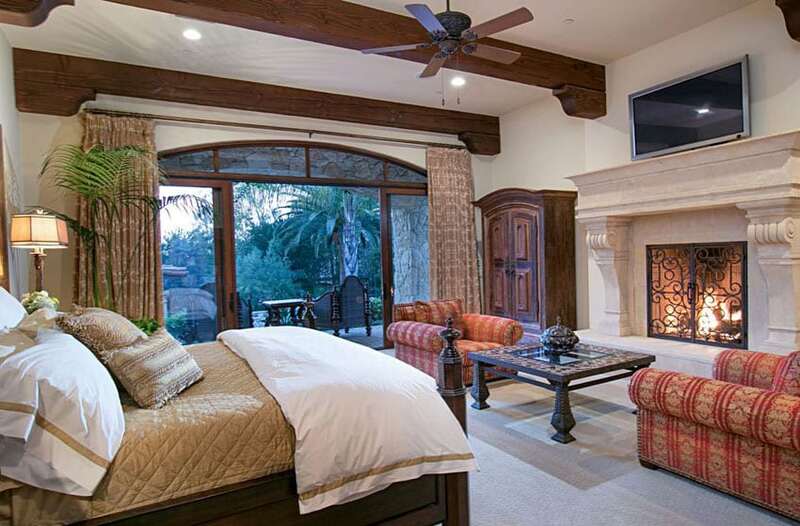 From this perspective of the master suite bedroom you can see the rich details of the stone fireplace with rustic wrought iron screen. 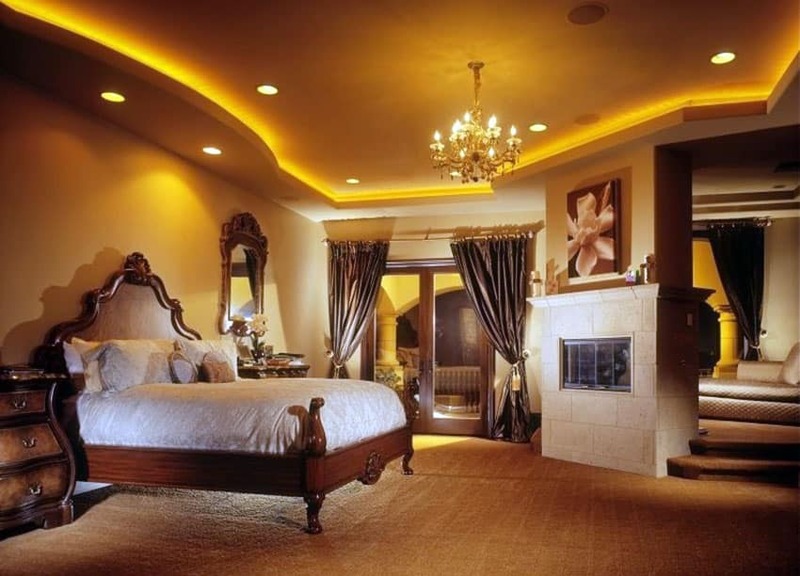 Luxury master bedrooms with fireplaces can definitely create a warm ambiance that will increase the rooms ambiance and overall appeal. Yellow walls give this bedroom a youthful & casual feel despite its use of classic furniture pieces. 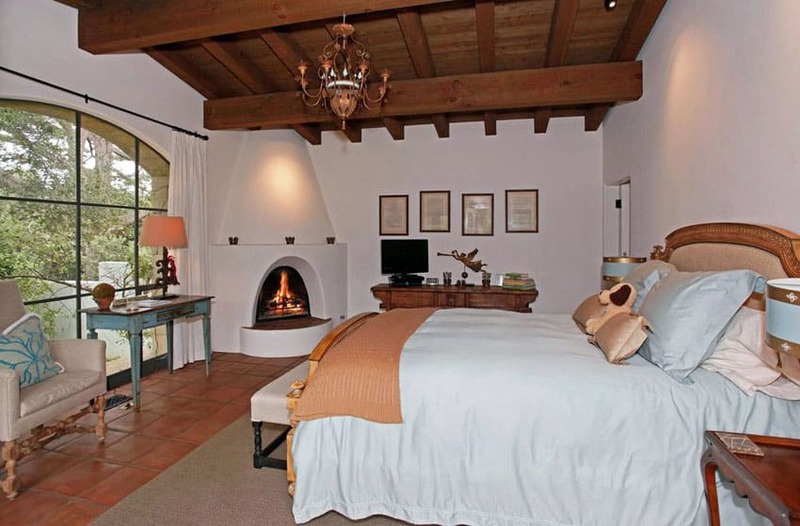 The bedroom was also fixed with a wood-burning fireplace placed on the room corner. It has no stand-out mantel and simply blends in with the wall color for a cleaner look. Large windows allows natural light to seep into the interiors of the bedroom well, which, in turn, tend to make the room a little cooler during colder months. 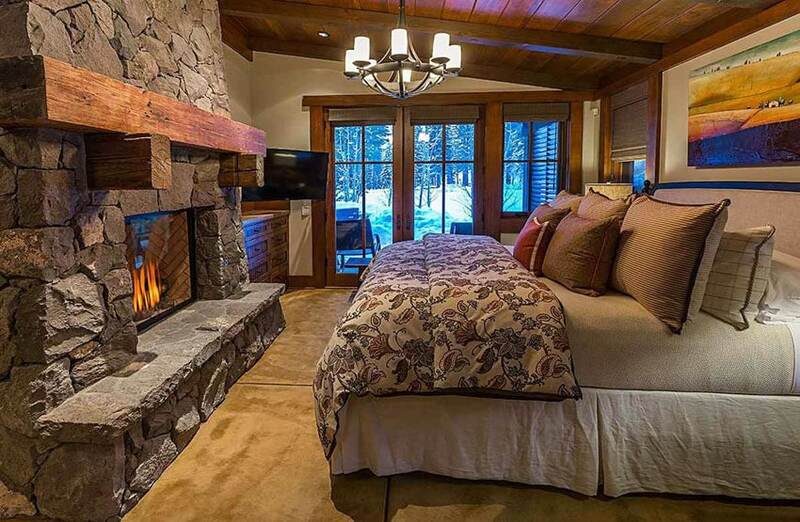 To make up for it, aside from the centralized heating system, a classic-style gas burning fireplace was installed in front of the bed, adding to both the warmth of the room & its ambiance. 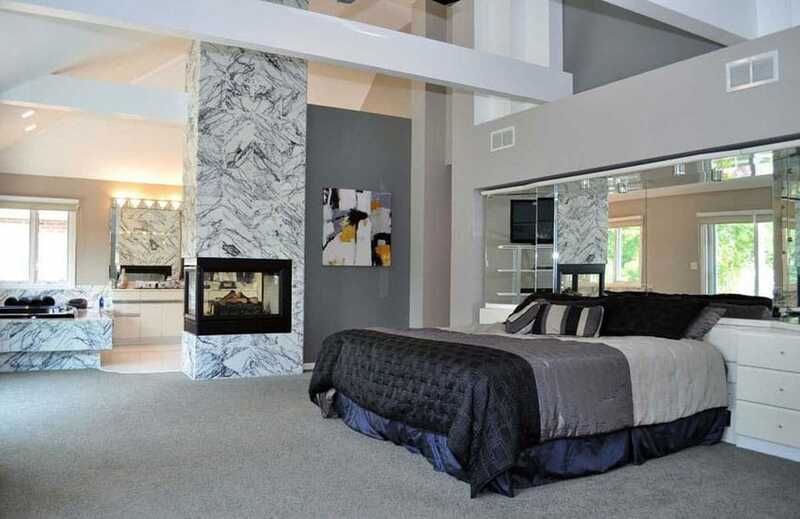 Since this bedroom uses carpet flooring all throughout, the wood-burning fireplace used in the bedroom was raised from the floor & surrounded with solid marble to avoid burning. While this has a very classic look, the TV hung right above it somehow makes it look a little more modern. While the previous example raised its fireplace to prevent burning the carpet, this example raised its wood-burning fireplace to help warm the high bed more. A mixture of contemporary interior architecture & classic furniture pieces, the bedroom exudes both the classy vibe of traditional style interiors & the sleek clean look of modern design. A modern Mediterranean-inspired bedroom which has large arch windows allowing natural light inside & a gorgeous view from the bed. Since the space is quite small, the fireplace was built into the corner of the room in a quarter circular shape & arched opening to match with the architectural style of the space. 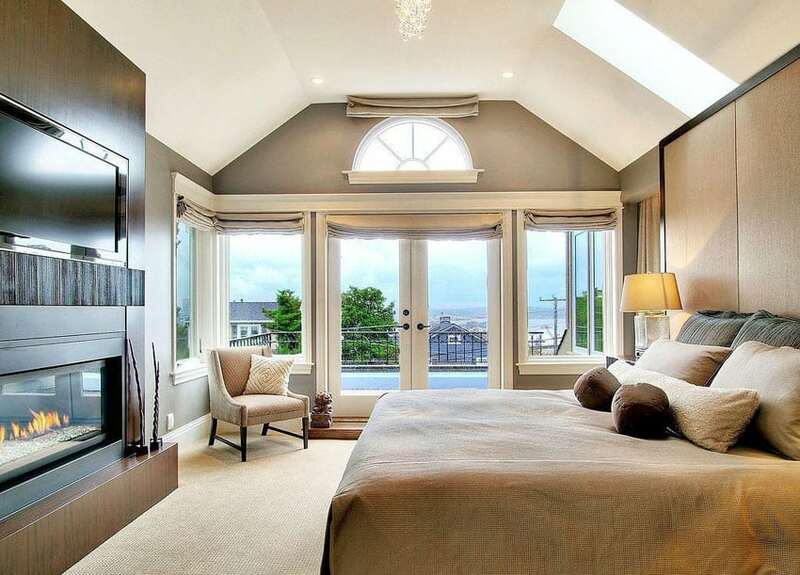 This a gorgeous contemporary bedroom design with a simple beige, gray and white color scheme. The large bedroom has a sleeping area & a sitting area separated by a partition wall. The gas-burning fireplace was installed around the edge of the partition and has glass on 2 sides so that it serves both the sleeping & sitting areas. This penthouse bedroom separates its bedroom from the kitchen with a partial wall partition & clads its edge with the same marble finish used on the countertops to create a coordinating look. The gas-burning fireplace installed on the wall partition is modern in style, with black metal frames and glass on its 3 sides. 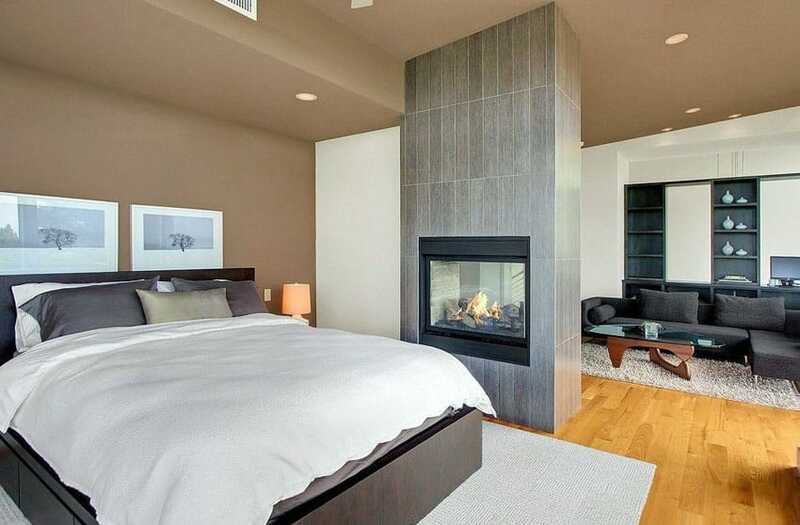 This minimalist bedroom integrates its modern style into its electric fireplace. The fireplace used has a very modern minimalist design, with black framing, reflective glass and a slim design, making it look like a small tv or a media cabinet instead of an actual fireplace. A contemporary bedroom which combines minimalist aesthetics with South Asian patterns and colors to create a simple eclectic look. Engineered Mahogany was widely used on the basic surfaces to create a dark yet warm & cozy feel. They used a hanging stainless steel fireplace with an onion bulb shape to match the South Asian motifs. To match the look of this bedroom which has classic furniture pieces & contemporary styling, a modern style electric fireplace was used,which in turn helped save space as the room is quite small. To give it a more classic look, the surrounding surface of the fireplace was clad in white slate tiles and framed with white wood for the mantel. 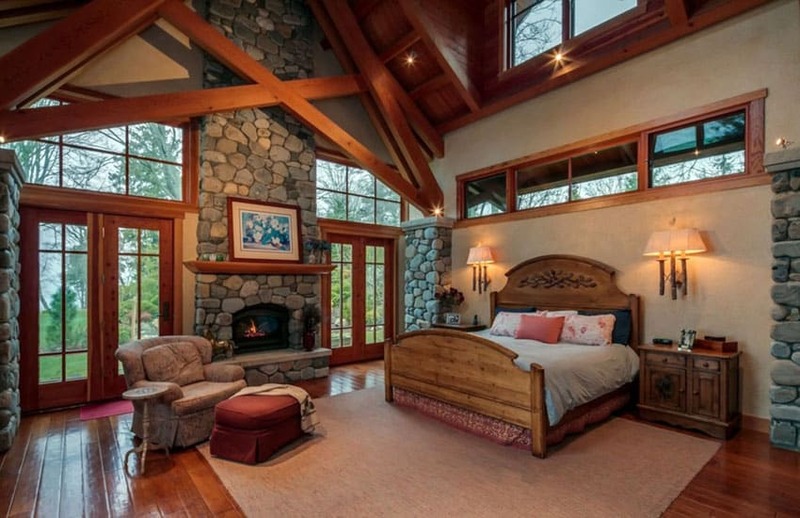 The combination of wood & stone definitely give this bedroom a very rustic & romantic appeal. Due to the limited space, a gas-burning fireplace was used, but in order for it blend with the rest of the interiors, the fireplace was clad in slate masonry tiles. 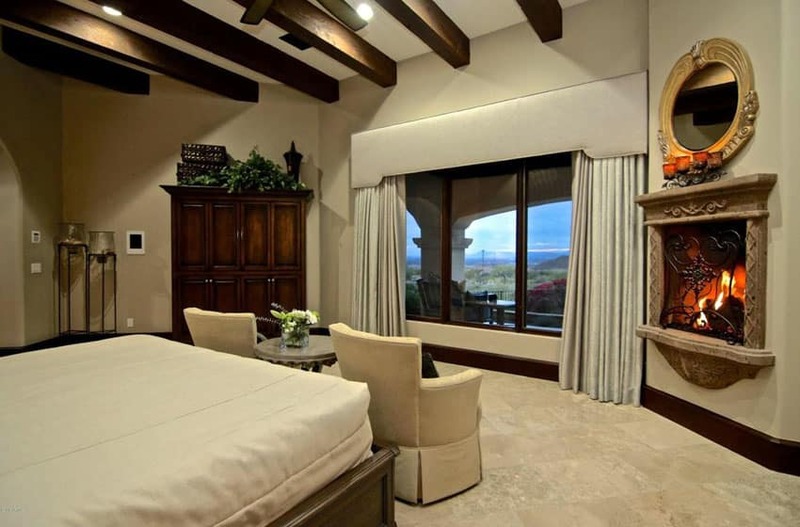 Similar to the previous example, this bedroom has a pleasing combination of a warm neutral palette, wood & masonry finishes. The higher ceiling height & bigger floor area gives it a lighter feel, however. A gas-burning fireplace was used for this as well and was also clad in faux stone masonry to match the look of the columns. Modern styling aesthetics combined with classic motifs and furniture style gives this bedroom a modern yet classy appeal. For this, a gas-burning fireplace with black matte body. It has an all-white neo-classic inspired mantel for added emphasis. This classic style bedroom has a light and casual feel because of its soft cream color scheme and numerous windows. The indoor plant also adds to the ambiance of the room. 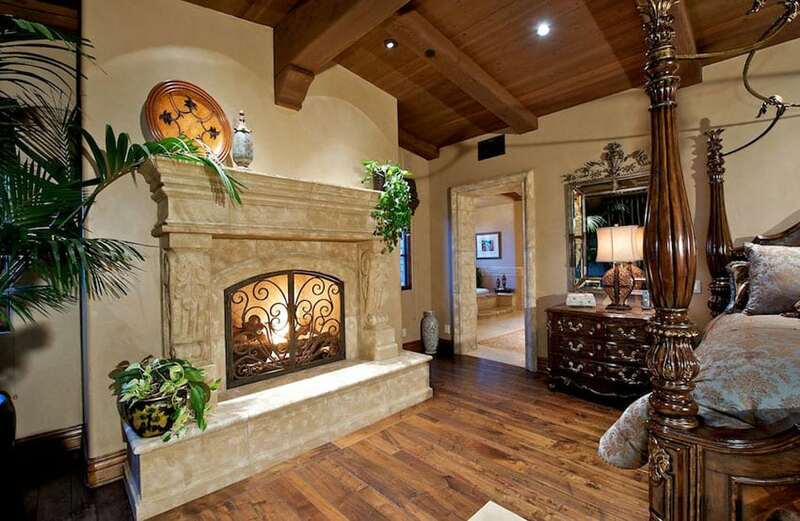 The gas burning fireplace adds a romantic feel to the room. It was framed with a painted wood mantel to accentuate the area. A gorgeous bedroom with a soft yellow & white color scheme and a light, contemporary look. The electric fireplace adds to the ambiance of the place and completrs the romantic appeal of the room. 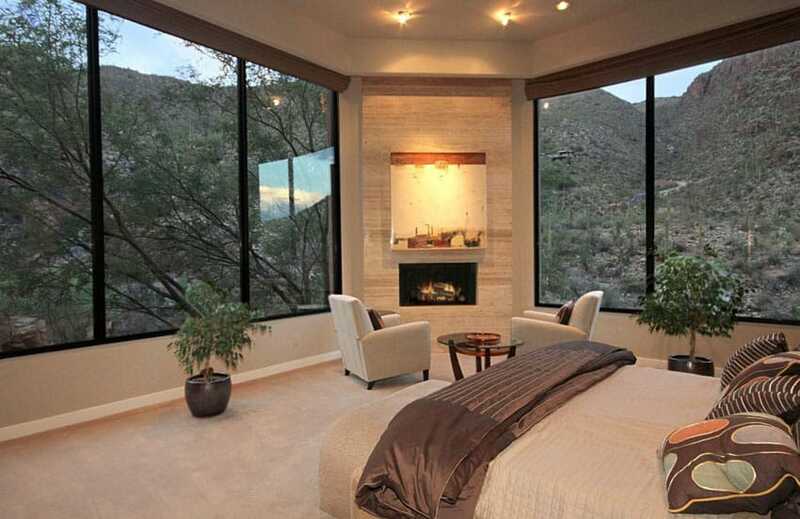 This gorgeous modern bedroom with large picture windows is definitely dream house material. 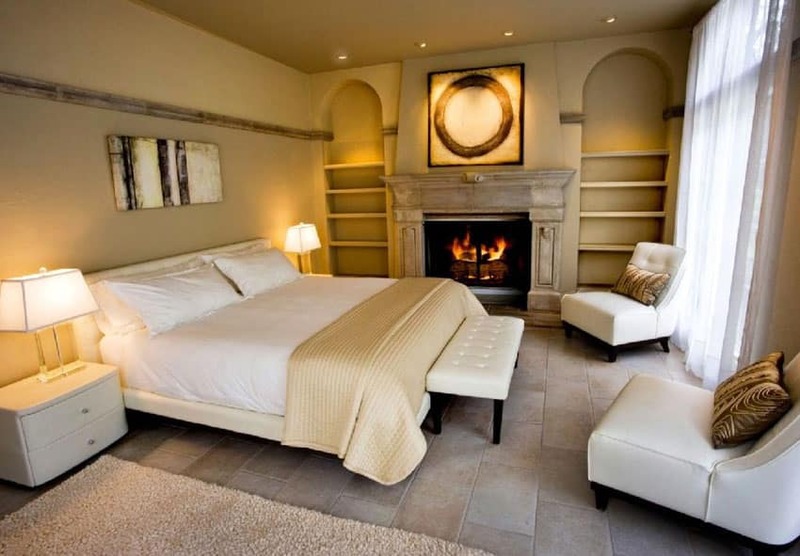 In this bedroom, an electric fireplace was installed on a diagonal wall corner with horizontal sandstone tiles as accent and an artwork hung right above it for further emphasis. 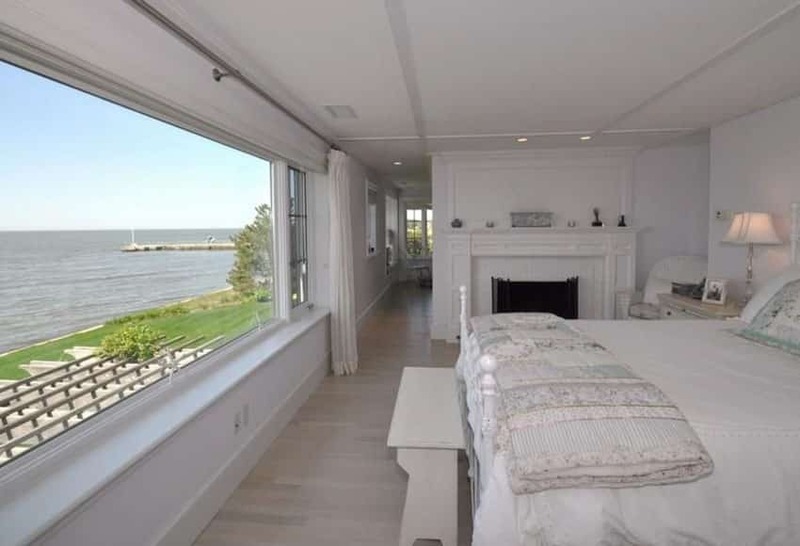 Luxury master bedrooms with fireplaces such as the one in the image use a muted color palette to showcase the dramatic picture window and water views. The electric fireplace was discreetly installed on the wall on the side of the bed and framed with simple white-painted wooden mantel to accentuate the area.